Film's most recognizable inverted-syntax speaking puppet, Yoda of Star Wars fame, was nearly not a puppet at all. 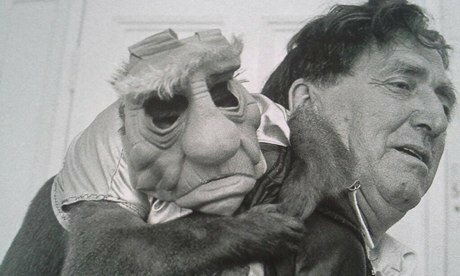 It was recently revealed that director George Lucas seriously considered casting a monkey to play the Jedi master in the 1980 classic The Empire Strikes Back, believing that puppetry just wasn't cutting it. A monkey was brought in to try out for the role, seen here in costume. Though, as The Guardian notes, go well in the audition things did not. The monkey alternative was ultimately abandoned when it emerged the simian in question preferred pulling his mask off and waving it about to actual acting. Try as they might, animal handlers could not train their new cast member.